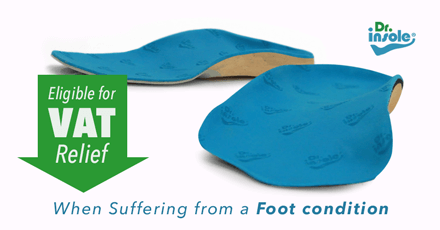 Dr Insole has provided custom made orthotics to many satisfied customers. Our products are highly effective at relieving symptoms and increasing stability, and come recommended by podiatrists and GPs. As medical devices, most of our custom insoles are eligible for VAT relief. Custom made orthotic insoles handcrafted in the UK. 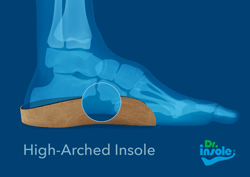 Dr Insole provides orthotic insoles for flat feet, high arches, plantar fasciitis and a range of other foot conditions. Our insoles are entirely handmade in our London workshop. A combination of careful material choices and detailed crafting techniques produces insoles of exceptional quality and value. The process begins with a free initial consultation, during which we perform a gait analysis and take prints and casts of your feet. After ten working days we fit the insoles to your shoes at a second appointment. 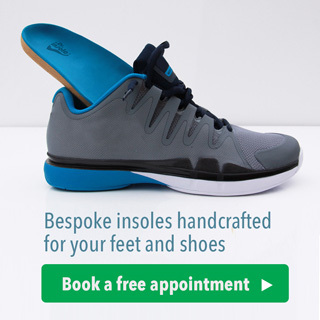 Customer care is a top priority - we carry out adjustments free of charge, offer discounts on additional insoles and have a money-back guarantee on all products. Our prices typically range from £239 to £309, depending on insole length, shoe size and insole type. We only charge for the insoles, all appointments are free. Flat feet, high arches and plantar fasciitis are the conditions we see most frequently, but we have made many insoles for metatarsalgia, leg length discrepancy and more. Our insoles are made from scratch using a blend of materials of different densities, so we can address a number of foot conditions. Flatfoot deformity affects about 20% of adults in Britain. This condition occurs when the inner foot arches flatten while standing or walking. Consequently,, the entire surface of the bottom of the foot comes in contact with the ground, causing the feet to roll to the inside (overpronate). Overpronation causes body weight to be distributed unevenly, placing strain on ligaments and joints. Custom made orthotics can help alleviate pain and discomfort by correcting posture and gait and offering stability and support. 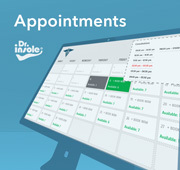 Book a Free Appointment ! The consultation usually takes about 30 minutes and includes gait analysis. Our specialist will discuss your symptoms and requirements, take prints and make casts of your feet, and offer a no-obligation quote. 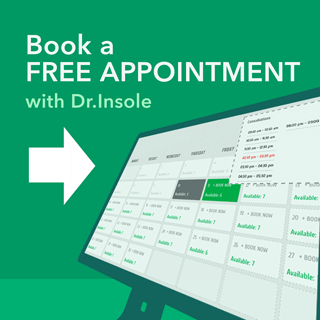 Call or email our helpful team if you have any questions about our insoles. 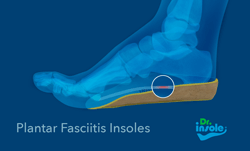 Heel pain can be a sign of plantar fasciitis, a condition that causes inflammation in the connective tissue in the sole of the foot. A recent foot injury, high arches, flat feet, obesity or being on your feet a lot can increase the risk of developing plantar fasciitis. Heel pain can be significantly reduced through the use of correctly fitted orthotic insoles. High arches may be rigid, not becoming flat even when they bear weight. This can alter your gait and place excessive strain on your heel, ankle and ball of the foot. Other symptoms include corns, calluses, and toe deformities. Made-to-measure orthotic insoles can bring relief by distributing body weight more evenly, reducing pressure on the outside of the foot. 299 Muswell Hill Broadway, London.